The Fight For Europe – Clear Voice, Inc.
“Of all the events that have shaken the Soviet bloc in 1989, none is more fraught with history – or more implausible – than the polite encounter that will take place this week in Vatican City. There, in the spacious ceremonial library of the 16th century Apostolic Palace, the czar of world atheism, Mikhail Gorbachev, will visit the Vicar of Christ, Pope John Paul II. …the meeting of the two men symbolizes the end of the 20th century’s most dramatic spiritual war, a conflict in which the seemingly irresistible force of Communism battered against the immovable object of Christianity.” Richard N. Ostling, Cross Meets Kremlin, Time, December 4, 1989. The fall of the Soviet Union began in the country of Poland. It was the cooperation between the United States under President Reagan and the Roman Catholic Church under Pope John Paul II in supporting the Solidarity movement in Poland. The Soviet Union came under tremendous pressure in Poland and communism finally collapsed there. Like dominoes, other eastern bloc countries fell one after another making the late 1980s and early 1990s one of the greatest eras of change in modern times. But, today, a different threat to the European way of life is looming. Atheism had at one time conquered much of Europe and was threating to swallow up more territory. Today, it is the threat of Islam that will so change the face of Europe, it will unrecognizable. Recent terror attacks and no-go zones in European cities highlight the cultural clashes between competing worldviews. President Trump’s speech in Poland’s capital of Warsaw on July 6, 2017 was a ‘We’re not going to take it anymore!’ speech. Though not expressed in these words, Trump declared that the war of civilizations was on. 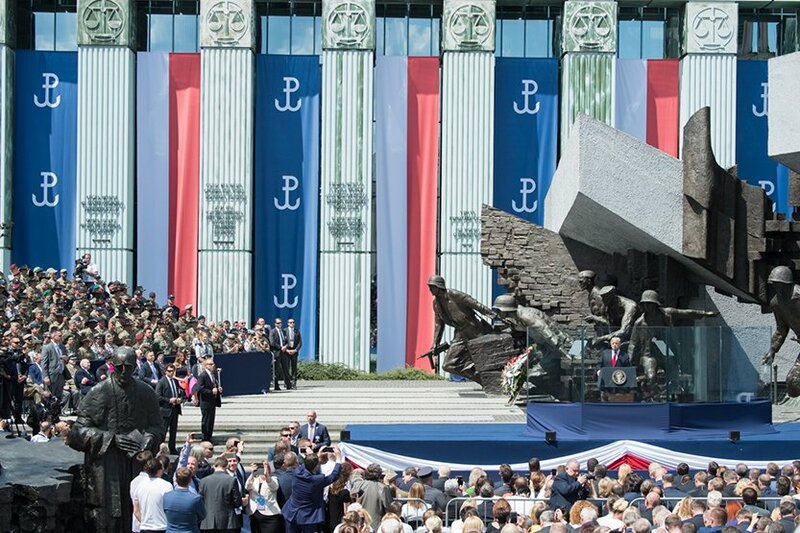 President Trump reminded the Polish people that it was faith, family and tradition that kept them together and helped them through the horrors of the Nazi and Communist occupations in the 20th century. They are, he said, what bind us together today. President Reagan and Pope John Paul II pledged to work together to bring down the Soviet Union that was threatening to engulf Europe. Poland was the beachhead. Will President Trump and Pope Francis work together to confront the growing threat of “radical Islamic terrorism” that is now threatening Europe? Though Pope Francis says Islam is not a problem, European churches are empty while European mosques are full. Some of those empty churches have been converted into mosques. ISIS is on record more than once saying they are coming for the pope and will fly their black and white flag atop Saint Peter’s. What will unite East and West in the struggle for peace? How will “faith and tradition” unite church and state to form another beachhead against conflicting worldviews? “Faith and tradition” is as much the message of Pope Francis as it is of President Trump. Trump has just said Europe and indeed, the world, is at war over it. Pope Francis believes “faith and tradition” are under attack as well. Revelation chapter 13 says the nation of which Trump is the President will so agree with the nation that Jorge Bergoglio is Pope of, that the United States will do battle for the Holy See. They joined together in the 20th century and, according to the prophecies of the Bible, will do the same in the 21st century.